In 2017, Ram trucks accounted for 37 percent of FCA sales in Canada. 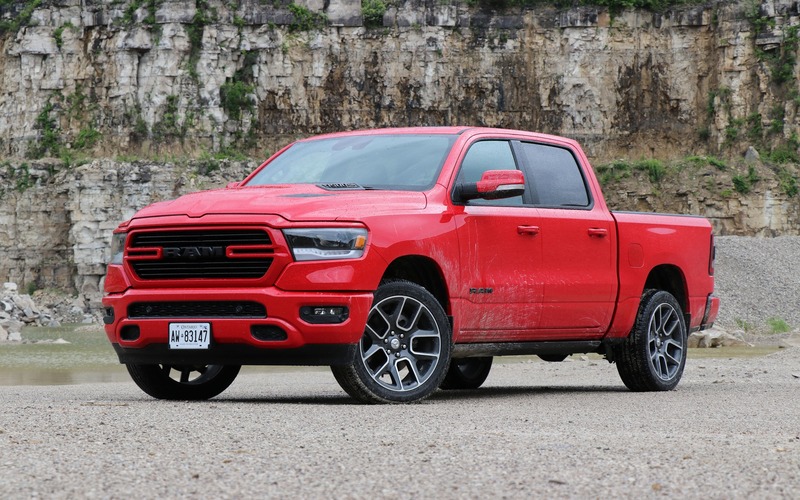 What’s more, 25 percent of Ram 1500 buyers opted for a Sport model, which is not even available in the U.S. for the 2019 model year. Why is it so popular north of the border? The folks at FCA claim that a majority of customers live in cities or large urban areas and don’t necessarily need a truck, but still wanted one like the Ram 1500 Sport for its style, power and versatility. A more aggressive hood design, a sport exhaust system, 20- or 22-inch wheels, a monochromatic exterior (with no flashy chrome) and more set this particular model apart from the rest of the lineup, which is all new for 2019. By the way, both the ST and SLT continue to be offered as 2018 models, allowing Ram to advertise bargain-basement prices until a future midsize pickup is introduced—likely to be named Dakota. The 2019 Ram 1500 catalogue includes seven trim levels ranging from Tradesman at $42,595 to Limited at $70,695 before taxes and options. The Sport model retails for $53,095 to $59,195. It’s a significant hike, for sure, but don’t forget about the inevitable rebates from the manufacturer. The question is: Does the new Ram 1500 justify its price tag? Initial production of the 2019 Ram 1500 was hit with delays, which has cost the company a great deal in terms of U.S. sales these past six months. Things now seem to be back to normal, with FCA focusing on 5.7L HEMI trucks that are still rated at 395 horsepower. The slightly revised V8 promises better fuel economy thanks in part to expanded use of cylinder deactivation technology. That being said, the biggest powertrain improvement for 2019 is a mild hybrid system called “eTorque.” This isn’t something like what you find in a Toyota Prius—far from it—but rather a belt-drive motor generator unit combined with 48-volt battery pack that enables seamless start/stop function, short-term torque assist and brake energy regeneration for small gains in efficiency. A $500 option with the HEMI, the system comes standard on the base Pentastar V6. As for the 3.0-litre EcoDiesel V6, it will be offered later in the year, apparently with a number of updates designed to better challenge Ford and GM diesel engines. 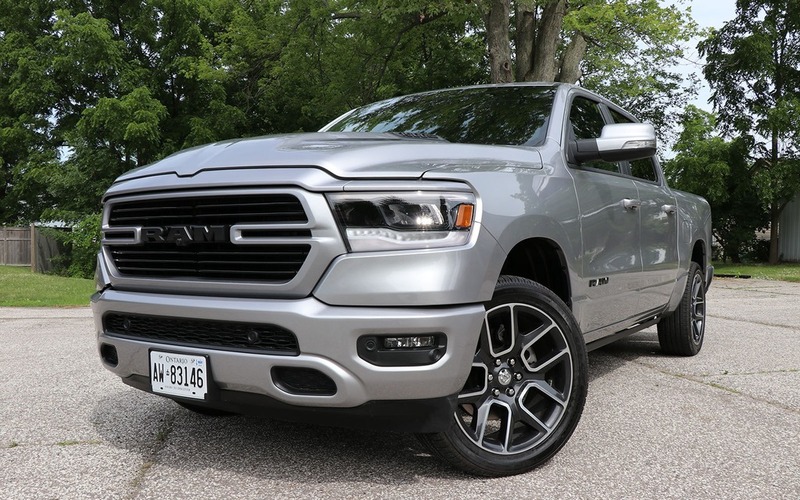 There’s no better way to assess the new 2019 Ram 1500 Sport than to drive the outgoing model beforehand, since you can compare changes and improvements directly. That’s what I did and I can tell you that the truck has evolved in almost every respect. Sure, the engine selection remains pretty much the same, with still fewer options than competitors, but the technical upgrades made by FCA engineers result in exceptional ride and handling, marking a giant leap from the previous generation. The 2018 model already stood out on the road thanks to an exclusive rear five-link coil suspension design, but the company went a step further by adding all-new, load-sensitive Frequency Response Damping (FRD) shocks and completely refining front suspension geometry while fitting it with lighter components. Body roll and rear-axle hop are greatly diminished. So is the lack of stability in corners. Even with the available 22-inch wheels, the level of comfort and solidity on the road is unprecedented for a pickup truck. Of course, you can always specify the self-levelling, four-corner air suspension that benefits aerodynamic efficiency, ground clearance and ride quality depending on the setting. Trailer coupling is also made easier: You can lower the truck, back it up until the hitch is right under the receiver and raise the truck up to make the connection. This option costs $1,895 and I sincerely hope that reliability won’t be a concern like it has been in the past. Because it’s lighter, built on a more rigid chassis and equipped with stronger brakes that now approach 15 inches in diameter, the 2019 Ram 1500 proves more fun to drive, more compliant and safer than ever. The truck’s wide array of skills doesn’t make it feel like that big of a vehicle, which will no doubt please outsiders looking to make the jump to a full-size pickup. The cabin is quieter, too, with acoustic glass and robotic sealing of joints working wonders. Admittedly, the Ram 1500 has lost some of its aggressive character. The semi-trailer truck nose that was successfully introduced way back in 1994 gives way to a more refined and more mainstream look. Certain models like Sport and Rebel obviously add dynamic touches, but that doesn’t change the fact that many Ram enthusiasts feel let down by the new 2019 design. A gain of four inches (10 cm) makes the new Crew Cab longer than the Quad Cab, which is identical in length to last year’s. Single Cab models continue in ST and SLT trim with the outgoing generation only. While the exterior of the 2019 Ram 1500 draws mixed reviews, the interior gets near-unanimous approval by offering the most attractive environment of any pickup to date. First of all, rear-seat space has been maximized and you can flip the seat cushions up to access a true flat-load floor. FCA brags about offering best-in-class interior room, but if you ask me, it’s kind of a moot point since all double-cab pickups these days have more room than you will likely ever need. Up front, look for unmatched comfort even in the Ram 1500 Sport, which is more than $15,000 cheaper than the top-line Limited model. Material selection, attention to detail and build quality trump everything that’s been done before in a full-size pickup. Consider the inviting and richly appointed layout, the magnificently designed driver’s cockpit and the substantially more comfortable seats. The driving position is improved, as well, and the telescoping steering wheel (finally!) plays a big role in that. The 2019 Ram 1500 boasts a payload of 2300 pounds and a maximum towing capacity of 12,750 pounds when properly equipped. How does that compare to Ford and GM trucks in real life? We need to do a full head-to-head matchup to find out. One thing is clear, though: People who buy a 2019 Ram 1500 can have total confidence in its abilities, not to mention its major upgrades across the line. It’s a serious player that commands a more serious price than before, but with increased capability. Here’s hoping that future FCA products benefit from the same focus on quality, because this Ram can definitely silence critics and sway rival pickup lovers. 6/10	More efficient than before, but not as much as the GM twins. 10/10	The most comfortable pickup truck to date. 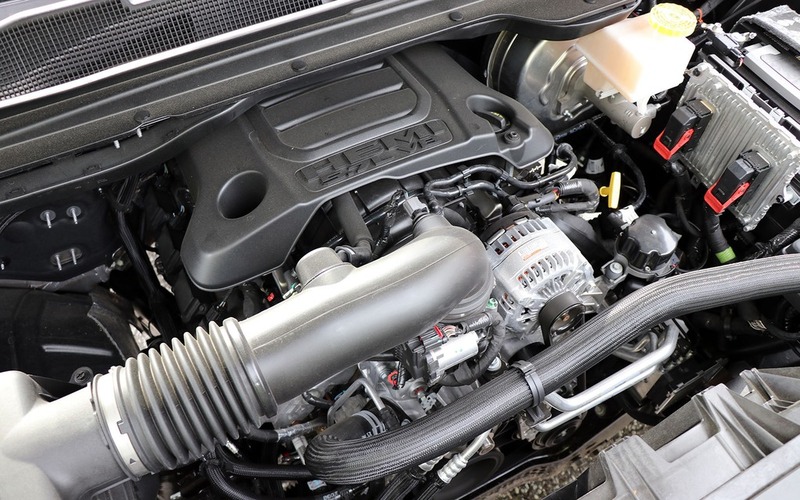 8/10	HEMI engine remains one of the most flexible and pleasant performers on the market. 10/10	Uconnect system should serve as an example. 8/10	Comfort, stability, handling and capability are definitely strong cards, here. 9/10	A truly great product with lots of appeal.